When exactly can Ontarians expect to go to the polls? Your guess is as good as anyone’s, but the consensus is this spring or early summer. Elections provide an opportunity to ask tough questions and demand clear answers. Demanding the answer is often easier than getting the answer, but sometimes the questions themselves and the issues they raise “establish a narrative,” as the pundits would say. They set the campaign direction and the eventual government mandate for the priorities of the province. Ever since Premier Dalton McGuinty won a minority government on October 6, 2011, Ontarians have been waiting for an election. While we were waiting, Premier McGuinty retired from politics and the Ontario Liberal Party elected Kathleen Wynne as their new leader, and the 25th Premier of Ontario. Under the new Premier, the Ontario minority government successfully avoided a general election with the passage of the 2013 provincial budget. But as the reality of minority politics has set in at the Legislative Assembly, we have seen MPPs retire, triggering by-elections. It is true that by-elections provide voters an opportunity to vote with impunity against the government, knowing that in the morning the Premier is still going to be Premier. Still, in a minority situation it does serve to help opposition parties test their campaign messages and build momentum towards a general election. In the seven by-elections (six Liberal MPPs, and one PC MPP retired), the governing Liberals held on to two seats, with the PCs retaining one seat and winning one seat from the Liberals, and the NDP winning three seats—all from the governing Liberals. The most recent February by-elections in Niagara Falls and Thornhill, won by the NDP and PCs respectively, have put everyone on election alert. And with a spring provincial budget expected, should the opposition parties vote against the budget, it would trigger a general election. In the event of an election, what can we expect? Over the past year, OHBA has had meetings with all three party leaders and their advisors, learning a great deal about their position on various issues of interest to the residential construction, professional renovation and land development industry. The governing Liberals launched two significant consultations on the Land Use and Planning System and the Development Charges Review (including parkland, Section 37 and voluntary payments). OHBA has responded to both and we continue to meet with the government to advocate for our members. The Liberals introduced changes to the Ontario Building Code effective January 2014, and also gave notice to new changes that come into effect on January 2015 and January 2017. The 2012 Healthy Homes Renovation Tax Credit, which supports home improvements for seniors, fulfills a 2011 Liberal campaign commitment. There is a long list of legislative, regulatory and policy items coming forward, including a new Provincial Policy Statement, the Growth Plan and Greenbelt Review, and the incorporation of six-storey wood construction into the OBC. There were two reports to government on how to fund Metrolinx’s $50-billion dollar Big Move transit plan. Among the recommendations are transit tolls and taxes, including a 15% Metrolinx development charge. 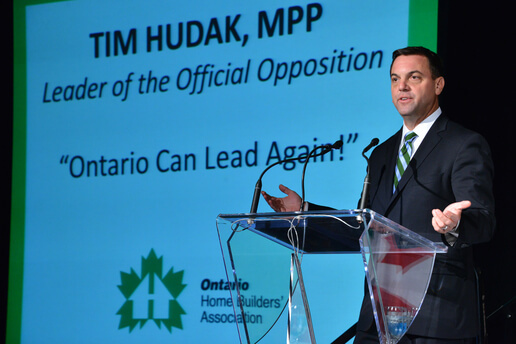 The Leader of the Official Opposition, Tim Hudak, has repeated his commitment to abolish the College of Trades, adopting a 1:1 ratio for all trade apprenticeships, eliminating the current mandatory WSIB requirement under Bill 119, as well as supporting home ownership for Ontarians. The Leader of the third party, Andrea Horwath, has not actually released any specific policy on industry issues, but the NDP has stated a clear desire to abolish the OMB and to limit municipal urban expansions and legislate inclusionary zoning powers for municipalities. Individual NDP MPPs continue to push to rewrite Tarion’s board structure, the Condominium Act and the Development Charges Act. This is a brief overview of where OHBA finds the Ontario political parties on some of the issues that matter to our industry and our members. However, in a general election, it is unlikely that these issues will be front and centre. They may influence the narrative that the leaders are currently creating, a narrative that they hope is their winning message to secure the Premiership. Recent polling puts the three provincial parties in a dead heat—in a range of 29%-33%. As for the popularity of the leaders, it’s again a dead heat, with Ms. Horwath leading most polls followed by Premier Wynne and Mr. Hudak. What do we expect to hear from the parties and their leaders during an election campaign? 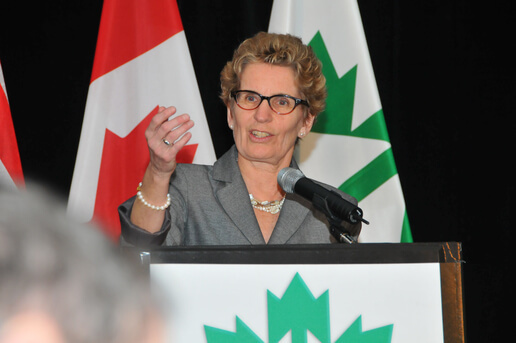 Premier Wynne’s campaign will centre on the 2014 Budget, expected this spring. The budget allows the Premier to clearly define the priorities of the government and challenge the opposition to respond. If the budget is defeated, we are into an election. Expect a budget that supports the three themes that Premier Wynne has been promoting: investing in people, infrastructure and business. Specifically, since the Metrolinx and Golden reports, the Premier has consistently said that transit will need to be funded through new revenue tools. 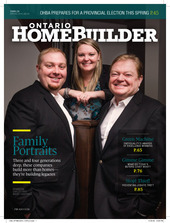 OHBA members interact in all of these themes. Whether it is fighting for apprenticeship ratios to be lowered as an investment in people, or supporting provincial funding of core infrastructure like roads, sewers and transit, or creating planning certainty so that OHBA member businesses can operate in a predictable business environment, these themes do have an impact on our industry. Tim Hudak has introduced his Million Jobs Plan, with a focus on job creation by bringing energy costs down, reducing taxes and debt and cutting red tape to create one million jobs in eight years. The PC leader’s narrative focuses heavily on the economy and jobs. Our industry continues to be a job creator in the Ontario economy and this narrative supports a number of industry and OHBA recommendations. Mr. Hudak’s earlier proposal to modernize Ontario labour laws has found a vocal and organized union opposition that has made him their target. Regarding transit funding, Mr. Hudak continues to promote subways as the best option for Toronto, along with provincial support for transportation across Ontario without new revenue tools. Ms. Horwath’s political approach continues to focus on pocketbook issues, such as lowering car insurance rates, along with demanding the inclusion of a “fairness” surtax on Ontario’s wealthiest in the 2012 budget. This approach has served her well in by-elections, growing her party’s seat count from 17 to 21 seats. Ms. Horwath has also identified small business as an NDP constituency. In fact, it was only with the support of the NDP that the government earned legislative approval for the Healthy Homes Renovation Tax Credit. The NDP continues to be vocal opponents of the OMB, Tarion’s board of directors and Ontario’s current planning approach. This is consistent with the NDP’s 2011 campaign platform, where it promised to stop “sprawl” and to stop government back-room deals to exempt developers from growth limits. The day before the 2014 Legislature returned to session, Ms. Horwath issued a letter to the Premier stating she will oppose any new taxes, tolls or fees that hit middle-class families with a focus on making their lives more affordable, not more expensive. The question is, are the leaders speaking to the voters or at the voters? The narrative only works to capture voters’ attention if it resonates and speaks to what is important to them. A recent Ipsos-Reid poll offered respondents 12 choices; a full 24% of respondents said jobs and the economy are the most important issues facing the province, followed by healthcare (11%), government accountability (11%), public transit (3%) and the environment (3%). The stage is set with the 2014 budget—the characters have found their marks and the scripts are written. But the ending is left for the audience—the voters of Ontario—to determine.